Typically ships in 1-2 Days. Some finishes may require extended lead time. Please call for availability. Solid Forged Brass: Entrance handle, cylinder collar, knob, rose, and turn piece are manufactured of solid forged brass for maximum strength and durability. 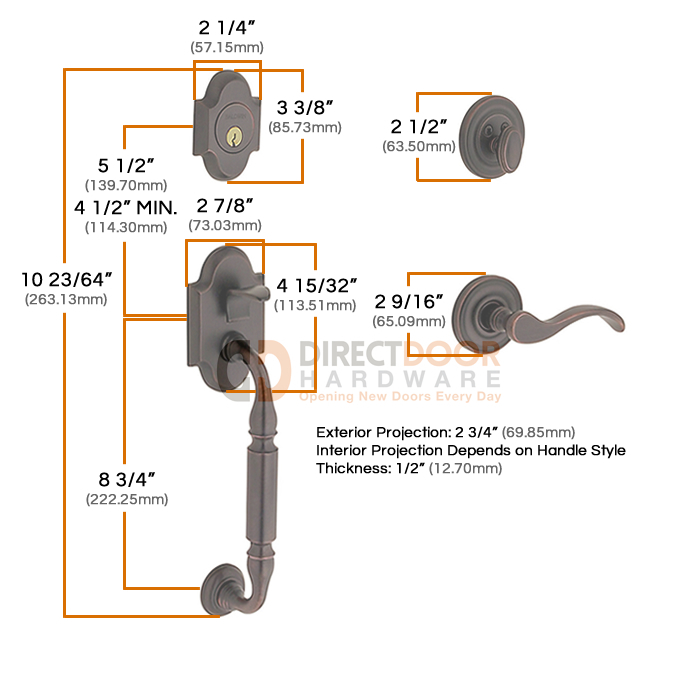 Installation: Images lock sets are designed fo easy installation in standard pre-bored wood or metal doors. The adaptor aligns the latch with the trim. Graphic instructions make installation fast. Door Thickness : Lock sets accomodate a door thickness of 1-3/4". Conversion kit available for 2" and 2-1/4" thick door. Case: Deadbolt and latch case are formed of steel for strength. Most interior parts are made of solid brass or steel for maximum strength and smooth operation. 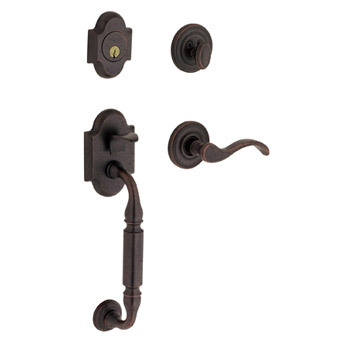 Backset: Adjustable backset 2-3/8" or 2-3/4" latch and deadbolt supplied standard. 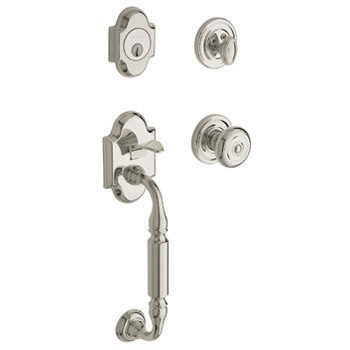 Faceplate: Deadbolt and latch are supplied with a 1"(25mm) faceplate. Bolt: Deadbolt and latch bolt are constructed of solid brass. 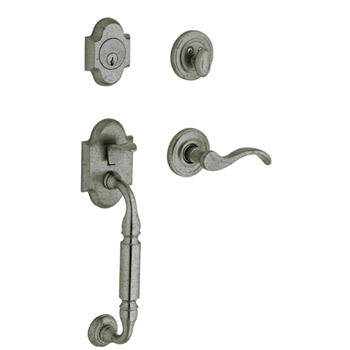 Deadbolt has 1" throw when extended and a hardened steel insert for maximum security and protection. Latch bolt has a .5" throw when extended to fully engage the door jamb. Fully Reversible: Accomodates most door conditions and facilitates installation. Distance Between Latch and Deadbolt: Lockset accommodates any center-center spacing greater than 4-3/8". Cylinder: Cylinder supplied with 5-pin keying. Cylinder is protected with free turning cylinder guard to resist gripping or twisting. Keying: All keyed entry products are available keyed alike. Door Prep: Designed to fit 2-1/8" face bore with no additional hardware. * Hand-relieved finish variances: Product finishes which are HAND-RELIEVED may vary in luster, hue and appearance as a result of handcrafted variances in the final finishing step. Single Cylinder Entrance: From the exterior of the door the thumbpiece operates the handleset latch and the key operates the deadbolt. 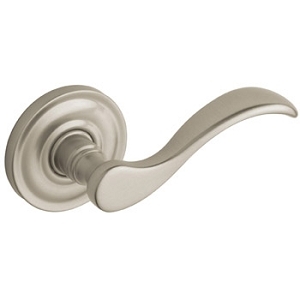 From the interior side of the door the knob/lever operates the handleset latch and a thumbturn operates the deadbolt. Double Cylinder: From the exterior of the door the thumbpiece operates the handleset latch and the key operates the deadbolt. 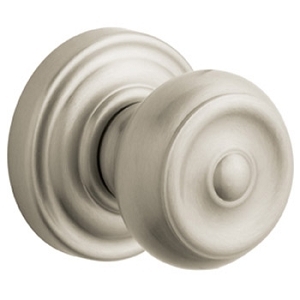 From the interior side of the door the knob/lever operates the handleset latch and the key operates the deadbolt. This option is not recommended for most exterior doors because if there is an emergency, occupants would have to search for a key before being able to escape. Full Dummy: Dummy trim is for non-working side of double doors. Matching dummy trim (non-functioning) handleset and interior trim.